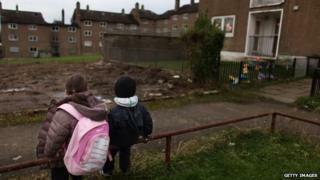 Almost a third of the UK population fell below the official poverty line at some point between 2010 and 2013, figures show. Around 19.3 million people - 33% - were in poverty at least once, compared with 25% of people across the EU, the Office for National Statistics found. But only 7.8% were defined as being in "persistent income poverty" in 2013 - less than half the 15.9% EU average. Pensioners and single parent families were found to struggle the most. The ONS records someone as being in poverty if they live in a household with disposable income below 60% of the national average, before housing costs. Persistent poverty is defined as being in poverty in the current year and at least two of the three preceding years. Summing up the findings, the ONS said: "Studies reveal that although some people are stuck in poverty, the majority of 'the poor' consist of a constantly changing group of different individuals." The report added that although "poverty persists only for a relatively small minority, evidence suggests that those who have already been in poverty are more likely to experience poverty again in the future than those who have never been in poverty". The UK ranked 13th out of the 28 EU member states for "overall poverty" - the proportion of people falling below the poverty line at some point during the four-year period. The ranking was topped by Greece, Romania, Bulgaria, Lithuania and Spain. The country with lowest overall poverty levels was the Czech Republic, followed by the Netherlands, Finland and Denmark. But since comparable figures were first made available in 2008, the UK has consistently had a persistent poverty rate lower than the EU average. The UK ranked 20th, with only the Czech Republic, Denmark, the Netherlands, Finland, Slovakia and Slovenia recording better results. Jonathan Cribb, research economist at the Institute for Fiscal Studies, says it's difficult to know exactly why the UK has lower levels of persistent poverty but factors around employment may be the reason. "The UK has lower levels of unemployment compared with other countries in the EU," he said. "The longer people are out of work, the longer they are in persistent poverty as they need to rely on out-of-work benefit. "Also, people who have the lowest incomes don't necessarily have the lowest spending. These people might be in income poverty for a short amount of time because they are self-employed or between jobs for example." Christian Guy, director of the Centre for Social Justice - a think tank that seeks to address poverty and its causes - said the figures only showed part of the problem. "Whilst it is very positive that the growing economy means that fewer people are stuck in poverty, the general figures on poverty show that this is a fatally flawed measure. "Income is only part of the story. Poverty is not just an absence of money - policy needs to focus on the drivers of poverty such as worklessness, family breakdown, education, addiction and serious personal debt."